The Rat & Mouse Repeller Advanced from Rentokil (Beacon FM89) emits a combination of ultrasonic and electromagnetic frequencies. This excellent rat and mouse repellent makes living within the same space unpleasant for rodents, driving them out of your home or business premises. Many Rat Repellents / Mouse Repellents on the market only work by emitting a ultrasonic frequency, meaning that they will only repel rodents within that area. This frequency will not penetrate anything solid, meaning it will deter rats and mice from entering that space but will not reach through to the areas where mice are often nesting, for example under floors, in roof spaces, or in cavity walls. 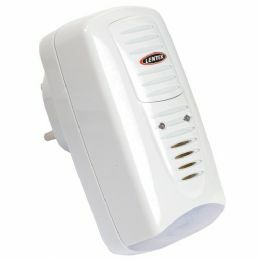 The Rat Repeller / Mouse Repeller from Rentokil, however, is dual action - both ultrasonic and electromagnetic. This means that in addition to the ultrasonic function, it also works by creating an electromagnetic field that works through the wiring of a building, which cannot be sensed by humans but makes living in close proximity very uncomfortable for rats and mice. The Rentokil Rat Repeller / Mouse Repeller is perfectly safe, will not cause any damage to the wiring, and has a very minimal running cost. This Rat Repellent / Mouse Repellent can be used together with any other rat and mouse control products. It is also an excellent tool for maintaining a rat and mouse-free environment following treatment and eradication. 1 x Rentokil Rat Repeller / Mouse Repeller will cover up to 232 square meters (2,500 sq ft). Please Note: This device is not suitable for use around rabbits, guinea pigs, hamsters or any other similar species.